The memory is followed by a montage of laborers set to the old union anthem “Solidarity Forever.” Solidarity was a big theme that evening, in both the films and in the discussion afterward. The self-consciously timely series, curated by South Side Projections’s founder and director Michael Phillips, aimed to illuminate the oft-neglected role of women and people of color in the U.S. labor movement. The other movie on the bill that night was The Willmar 8, about a group of Minnesota women who went on strike in 1977 over gender discrimination by the bank that employed them. Previous screenings included documentaries about Pullman’s Brotherhood of Sleeping Car Porters, which was the first African-American-led union recognized by the American Federation of Labor, and El Teatro Campesino, the United Farm Workers’s theater troupe. Phillips had the idea for the series when he noticed the prominence of labor as a theme he came across repeatedly while researching films to screen. Alongside South Side Projections’s programmer, Harrison Sherrod, he decided to narrow the series’ focus to the role of women and people of color in the labor movement. With the help of filmmaker and board member Peter Kuttner, and of Judy Hoffman, a filmmaker and University of Chicago film professor, he was able to assemble a list of eight films around the topic. “I think it really struck a nerve with people,” Phillips said, explaining the unusual variety of sponsors, including Aguijón Theater of Belmont Cragin and the Service Employees International Union for Illinois and Indiana. 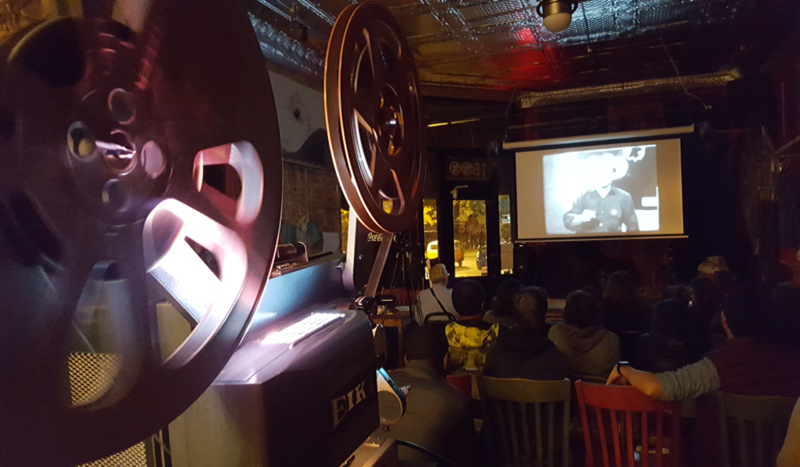 A grant from Illinois Humanities allowed South Side Projections to run the screening series, its second ever, as well as its longest and most cohesive. “We were able to do something bigger than normal. Normally our way of doing things is we’ll do a bunch of one-off screenings that aren’t particularly related to each other,” Philips said. The series seems to have struck a nerve with residents of the South Side as well. About fifty people attended the first screening—South Side Projections screenings usually attract between thirty and forty people—and attendance remained higher than usual for the rest of the series. In audience surveys, Phillips said, more than half of attendees have identified themselves as current or former union members. The first South Side Projections series, “The Streets and the Classrooms,” ran this past spring. It used postwar industrial and educational films as mirrors for social change, glancing off material similar to the labor series. But it wasn’t as successful at getting people into the seats. As Phillips acknowledges, it’s hard to make someone drive out on a weekday night to watch a movie intended for a classroom. It’s not all about numbers, though. Post-film discussions are a staple of the organization’s programming; the goal of South Side Projections since its inception in 2011 has been to use film as a catalyst to get people out and talking about the issues in their communities. The best screenings, for South Side Projections, are those that start the best conversations. 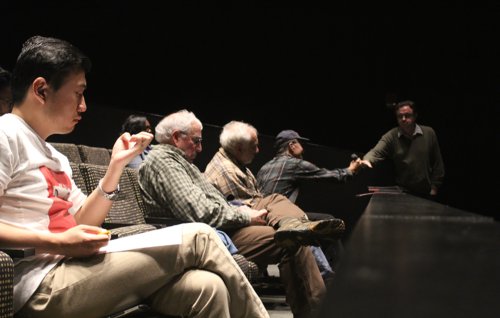 These discussions are so integral to South Side Projections’ work that even on the rare occasion, at a screening this October, that a discussion hadn’t been organized, people stayed and talked. The film they were discussing, The Great Flood by experimental director Bill Morrison, told the story of the Mississippi River Flood of 1927, which forced thousands of African Americans to join the Great Migration. Many of those remained to talk were their descendants. In this respect as well, the “Alternative Histories of Labor” series has been a success. The two speakers at the Logan Arts Center for the last screening were Julia Reichert, the director of Union Maids, and Sarah Joy Liles, a trustee of the Illinois Labor History Society and union member. The two sit on the dark screening room’s stage below the steep columns of light as Phillips, hitherto in the wings, strides about and hands attendees a microphone. The first question comes from a man who’s worried about a suspect rule at his job, in attendance incognito because he doesn’t want word carried back to his workplace. He decamps soon after. Later, another attendee asks about how to spread information about organizations that support organized labor. “It didn’t seem like this gentleman really knew where to turn for help,” the attendee says of the first questioner. At several points during the discussion, both speakers stress the isolation or fragmentation that the labor movement finds itself in, either unable to unite cohesively or uninterested in doing so. It’s as hard to avoid the election this evening as it’s been every day since November 9. Phillips is the one who brings it up today, taking the microphone for himself and saying, “Let’s talk about voting against your own self-interest.” Both he and Reichert have family members who voted for Donald Trump, and many at the screening commented that the election has given the series a special relevance. Now Phillips asks how to reach out to Trump voters. Several perspectives are offered. Reichert is skeptical whether a vote against the Democrats is obviously a vote against the self-interest of the working class. In her opinion, the Democrats haven’t supported organized labor. “I think folks are reaping what they sow, in a way,” she says. One person says she doesn’t feel unions have properly educated their members about the society that they live in. Another points to the modest success of the Working Class Party in Michigan as an encouraging sign. In an election season that often appeared to pit labor issues and identity issues against each other, the “Alternative Histories of Labor” series swam against the current, implicitly questioning the assumption that there needs to be any conflict between them, even if labor organizations have not always been havens of sexual and racial justice. “[Women and people of color have] been a big part of the rank and file,” Liles says while groups of lingerers talk after the discussion. “It’s time that we promote them to roles of leadership and really, not just for the sake of honoring them in that way, but for the sake of understanding what they have to offer. “I feel like the series has been a place for people to talk about, like, ‘What now?’” Phillips said before the labor series’ last screening. For his part, he’ll continue to do what he’s always done with South Side Projections. When he founded South Side Projections five years ago, he told the Tribune that the operation was “basically me, with my wife’s credit card.” Since then, it has grown somewhat and gained six board members. The labor series has also put it in contact with labor-oriented organizations with which Phillips hopes to partner in the future. But the model and the mission remain the same: partnering with community organizations to present films that South Side Projections believes will interest local people. Each screening is the spark of a discussion; collect them all, and who knows how much of the South Side’s history is lit up. love the subject matter. unions are rarely given a fair shake in today’s media.